Yesterday all I heard about was ‘Blue Monday’ and how it is considered the saddest day of the year. In response I wanted to offer some Holistic approaches that are easily accessible and affordable. Keeping in mind simply hearing about it all day can have a negative affect on us as words have the ability to affect our health and mood as well, google Dr Emoto’s experiments! I have experienced depression and SAD FIRST HAND! Before owning HHDS I had a few consecutive years where I knew I HATED winter and found myself spiraling into despair more as each year went by but usually peaking in the winter. 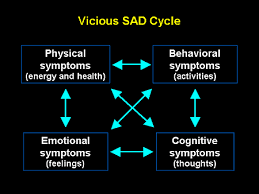 I had never heard of SAD, but a coworker suggested it might be the affects of this lack of exposure to the sun and suggested a tanning bed. Against my better judgement I was desperate and despite my having close family members with Skin cancer and having sensitive skin, I did it, and it seemed to work. The following year I took over the salon I worked in, made it Green and took my first Energy Healing lesson, Reiki Level 1, and I have not suffered the affects of SAD since. Over the past 7 years I have delved into the Holistic Health and Wellness pool, devouring all the knowledge I could. Ultimately attaining Master Level for Reiki, up to 3rd level in Shamballa, Celtic Reiki, Crystal Therapy and Becoming a Holistic Life Coach and Certification Instructor. While my curiosity grew as I became more and more aware of the profound positive affects this training has provided me with and subsequently my clients and staff, I have come to realize that empowering others with this knowledge is part of my purpose. 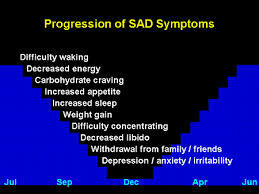 Many people think that SAD is just seasonal, and for the most part it can be noticed more during the months we have less exposure to Vitamin ‘D’. Although anyone with Mental Health sensitivities can experience SAD more frequently then those who don’t , anyone can actually suffer from it. Of course this inevitably causes a negative chain reaction through our whole lives. 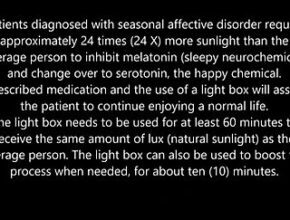 Main Stream Medicine has offered a solution with the SAD Lamp, offering much needed light from it’s radiance that mimics the light we would normally receive from the sun, and still others misdiagnose as a more permanent form of depression and will prescribed Depression medication. I have tried depression medication, I prefer an empowerment approach where I have more control, being that I am a control freak, this would explain my own approach. This in no way implies anyone on medication is wrong, but I do challenge you to try these following options before making a definitive choice! I LOVE Skeptics, but to make a true Skeptic, a healthy one is one that is educated and open minded! I myself am a skeptic currently and will always be. It is smart to question and test theories, then judge for yourself! The same light exposure from the Sun, and that I found helped me during my Tanning Bed experience is present in greater quantities through a Reiki treatment. 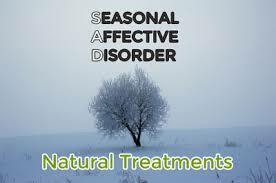 Only with Reiki there are NO negative side affects. ZERO. So there is nothing to lose and everything to gain from trying it. A Reiki treatment is performed by an attuned Reiki Practitioner, on a treatment table/bed fully clothed for anywhere from 15 mins to an hour. For more severe cases a full hour is recommended. The process is very relaxing and you notice positive impacts immediately. As time goes by through subsequent visits you begin to recognize when you need a treatment. 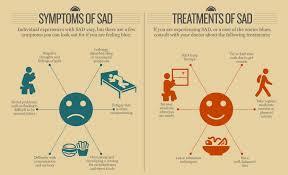 You will become so aware of how you feel day to day that you will start to feel when you need another treatment. 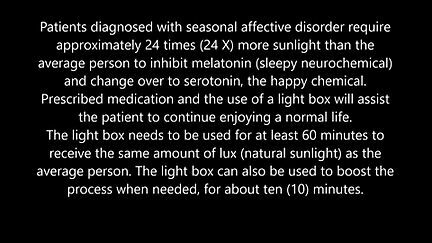 Some people may feel deterred by the repetitive nature and expense of this treatment, however it is no more so then refilling a prescription or purchasing a lamp and replacing bulbs. Keeping in mind Reiki can be enjoyed with no conflicting reactions during a prescription or using a SAD lamp. for even greater and long lasting affects. However if you are enjoying Reiki and you want access to that healing energy any time, get attuned yourself! Having the atonement allows you to self treat not just for SAD but for any headache, upset stomach, sprained muscle, for you and now you can offer it to your family and friends! Want to learn more about Reiki? Contact Kerstin Kramer, owner of Natural Health Touch offering Reiki Attunement at Hybrid Hair and Detox Spa, our next Level 1 Class is this coming Saturday Jan 21st 2017 from 9-4. To sign up call us at 519-886-8624 or contact Kerstin @ info@naturalhealthtouch.com. Crystals are incredible tools to combat SAD as well, one of the best being the ‘SunStone’. What makes crystals so effective is their molecular frequency. Everything is made up of molecules, including us. When pain dis-ease or imbalances occurs it is due to the interruption of frequency in the corresponding area. Like tuning a piano, choosing a matching Crystal will, ‘re-tune’ or rebalance the affected area when worn close to or directly on the body. Sensitive scientific frequency measuring tools are used to test these theories and have proved effectiveness. Crystal classes are also available to learn more, including soon to be posted at HHDS for the basic understanding and use of these natural healing tools. These too can be used in correlation with traditional medicines and approaches with no conflicting side affects, and they will expedite healing. Essential Oils can play a role in your self care as well. Citrus based oils and blends like ‘Joy’ from Doterra can boost your mood during the day and can travel easily in your purse for access whenever you need it. Using essential oils should be careful and educated, some oils can only be used on the skin and infused into the air, others can be ingested, so having a class before use is recommended, or consulting with an Essential oil educator. If your skin is sensitive using a traveler oil like coconut or olive oil is recommended. This too can be enjoyed by the whole family and provides you with yet another option to support your traditional medical approach if you wish. However make sure you share with your practitioner what oils you use as reactions to current prescriptions or new ones can happen. Without decreasing the magnitude of health affects from physical activity, getting outside to expose yourself to as much vitamin D as you can this time of year, I wanted to expand your prospects with self empowering and self implemented tools that might not have been in your tool kits of Self Care options. Now you can add more to your repertoire for you and your family! Want to try Reiki or crystals in a service? We offer both for just $1 a minute, book your Energy work service in between you hair and skin services or on it’s own, you won’t be disappointed!